Maybe it was the thought of moving, but somehow both the Accidental Locavore and her husband decided it was time to rough-up a few root vegetables. Here are three easy ways to do it, all of them simple enough to add your own touches, and good enough to leave as-is. I used a potato masher to smash and crush, however a pan, bowl or fist will work as well. All serve two generously. Preheat the oven to 400°. 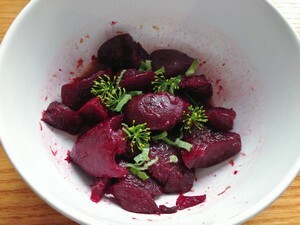 Place the beets on the foil, drizzle with olive oil and toss with salt and pepper. Seal up the packet and place on a baking sheet. Bake for 40-50 minutes until they are very tender. When they’re cool enough to handle, rub the skins off with a paper towel. Crush the beets. While the beets are roasting make the vinaigrette. Mix the lemon zest, juice and 1 tablespoon of olive oil together in a large bowl and set aside. Heat 1 tablespoon olive oil in a large sauté pan over medium-high heat. Add the beets and cook until browned, about 5 minutes a side. Put them in the bowl with the vinaigrette, toss to coat, and season with salt and pepper to taste. Garnish with mint and dill, serve and enjoy! Preheat oven to 450°. 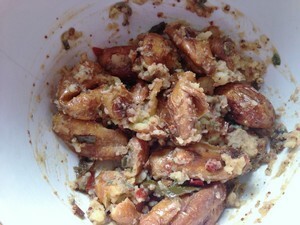 Toss potatoes with ¼ cup oil on a rimmed baking sheet; season with salt and pepper. Roast, tossing once, until golden brown and tender, 30–35 minutes. Let cool slightly, then lightly flatten. Meanwhile, whisk vinegar and mustard in a large bowl. Gradually whisk in remaining ¼ cup oil until emulsified; season with salt and pepper. Add potatoes, jalapeño and parsley or cilantro and toss; season with salt and pepper. Serve warm or room temperature. Preheat the oven to 400°. Put the potatoes in a pot, with water to cover. Salt the water. Bring to a boil and cook until tender. Drain. When cool enough to touch, squish them flat – just flatten until the edges break a bit but they are still in one piece. Toss in olive oil and season with salt and pepper. 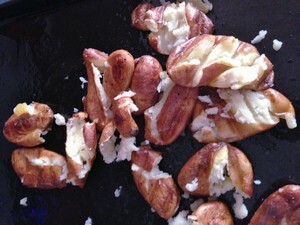 Spread the potatoes on a baking sheet and bake until crisp outside and soft inside, about 40 minutes. Serve and enjoy! My verdict: While we tossed everything in olive oil, I was reading a recipe for potatoes tossed in melted duck fat, so that will probably make an appearance in the next batch. The smashed potatoes were a little tough the next day as potato salad, so probably better to eat them warm or room temp. Grilling any of these would be an interesting idea (and lead to a cooler kitchen). How do you like to abuse root vegetables?